Adieu the little yellow train? If action is not taken, the Little Yellow Train will close down for good in January 2016. 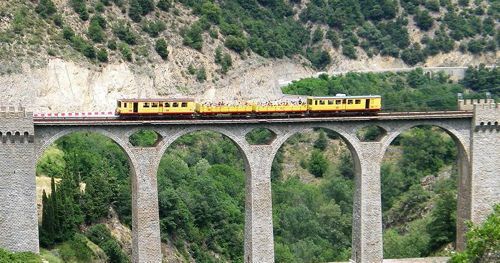 Petitions have been circulating for months to save this Catalan treasure but despite more than 35 000 signatures, the future of Le Petit Train jaune is not looking rosy. The investment required to renovate, modernise and make the train and track safe is a whopping 125 millions euros. If the sum isn’t found somewhere, the trains and track risk being dismantled and abandoned – or at best dumped in a museum. The association ‘Collectif pour le Train jaune’ is fighting tooth and nail to hang on to this important part of the regions heritage, but on 4 August 2014, a court condemned the train to closure in 2016. With 400 000 passengers in the year 2000, visitors have now dropped to around 180 000. Several reasons are possible for this – the high ticket price. (74,40 euros for a return Villefranche Font-Romeu for 2 adults and 2 children), the speed – or lack of it, and timetables which aren’t always suitable…. As station master of Villefranche-le-Conflent for many years, Monsieur Molinier, now retired, had prime responsibility for the daily running of Le Petit Train Jaune – and especially for ensuring that up and down trains didn’t crash into each other on the single line! At each of the 6 stations with passing points between the two terminuses, the train driver had to wait for M. Molinier’s authorisation by radio to continue. These were Olette, Fontpédrouse, Mont-Louis, Font-Romeu, Saillagouse, and Bourg-Madame. Altogether there are 22 stations on the 62.5 kilometre stretch of line from Villefranche to Latour-de-Carol, with the remaining 14 being request stops. M. Molinier will never forget the year 1985 when the line was again threatened with closure (Doctor Beeching style) because it was losing money hand over fist. First the railwaymen of Le Petit Train Jaune went on strike, supported by all and sundry including many local politicians. However, it was only after a national strike of SNCF railway workers that the line was saved, and a decision made to try to exploit its tourist potential. It is now one of the most used lines on the SNCF’s TER networks, taking a reported 400,000 passengers a year. Even regular motor car users in the Cerdagne are glad to use their “little mountain canary” when the RN116 is blocked by snow or rockfalls. 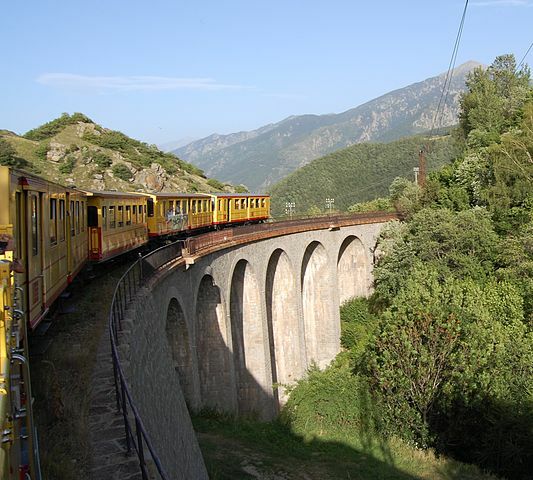 Le Petit Train Jaune is the highest train line in France. It rises continuously from Villefranche-le-Conflent (427m) to the col de la Perche (1592m), before descending to Bourg-Madame (1143m) and rising again to Latour de Carol (1230m). The track gauge is one metre, making the terminus station of Latour de Carol unique in France in accommodating three gauges: 1000mm for Le Petit Train Jaune, 1436mm for French trains (standard European gauge), and 1668mm for the Spanish trains. You can see the station here showing all three trains, with a Spanish one on the far right. The bodywork and interior furnishings of most of the coaches were replaced in 1984, as were the levers and controls in the drivers’ cabs. Incredibly, however, although regularly maintained and overhauled, the thirteen Z 100 motrices or powered units are the original ones in use since 1910. One axle box is clearly marked MIDI 1908 – signifying that it was built in that year by la Compagnie des Chemins de Fer du Midi. 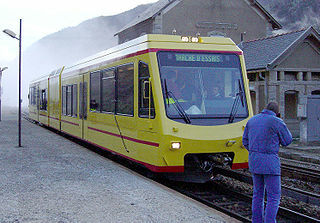 Only in 2004 were two brand-new panoramic Swiss-designed trains (Z 150) added to the stock – which also includes two snow ploughs (Z 200), breakdown units, goods wagons et al. The trains are powered by electricity from a third rail. Before you ask, it seems there has been only one fatal accident on the line since it opened, when a man slipped hands and feet onto the live rail while taking photographs. There have also been two suicides. Death warnings are everywhere: DANGER DE MORT A TOUCHER LE RAIL EXTERIEUR A LA VOIE. Although there were at least two powered-rail systems in France before Le Petit Train Jaune – on the Paris métro and the Le Fayet mountain railway at Chamonix – this was the first to use 850 volts and be powered autonomously. 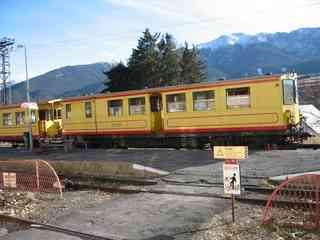 Le Petit Train Jaune is fed by a huge hydroelectric system from the barrage of Les Bouillouses (altitude 2016 metres). This feeds several substations lower down – at Villefranche, Thuès, Fontpédrouse, Mont-Louis, Font-Romeu, Sainte Léocadie and Bourg-Madame. The whole of this hydroelectric system now belongs to SHEM, the Société Hydroélectrique du Midi and can supply enough electricity for 10,000 households. Gentlemen and boys! (Is there any difference when it comes to trains?) You can take a short but thrilling trip here in the driver’s cab. The real museum piece is still in active service: the “enregistreur Flaman” on the driver’s left indicates speeds and times and records them with a stylus on a piece of unrolling paper. It’s a sort of ticker tape, or even a tachograph well before its time. Not that there’s any real need for the latter because the train’s average speed is 30km/h and the maximum authorised speed is 55 km/h. Altogether there are 650 designated “works of art” along the line – far too many to mention here. The list includes 19 tunnels – the longest being Pla de Laura (253 metres) – and these two spectacular bridges! Both were listed as historic monuments in 1994. Le Viaduc Séjourné (or Fontpédrouse), 18 kilometres along the line from Villefranche, and just beyond the station of Thuès-Carança. Designed by Paul Séjourné and completed in 1908, it is 65 metres high above the river Têt and 230 metres long. It boasts a magnificent lower section in the form of a pointed arch with two secondary arches on either side of the keystone. Le Pont Gisclard (or Pont de Cassagne). A little further along the line, this breathtaking structure was designed by Albert Gisclard and is the only suspension bridge in use on any French railway line. 240 metres long and 80 metres high, it was completed in 1909 and was the scene of a tragic accident on 31 October of that same year. During a test run over the bridge in freezing weather, the brakes failed, the train skidded over the bridge and crashed violently into rocks after rounding the first bend. Six men were killed including Gisclard himself. “L’accident du Paillat” remains embedded in local memories. Two men of extraordinary vision and initiative must take credit for the launching of the line in 1910. One was Jules Lax, a bridges and railways engineer who was the controlling director of the Compagnie des Chemins de Fer du Midi. The other was Emmanuel Brousse, elected as a Councillor of the Conseil Général (P.-O.) in 1898. A passionate and talented orator, Brousse tackled the project head on, successfully pleading the need for the French state to “unlock” the Cerdagne by means of the line, and exploit the region’s natural resources and tourist potential.